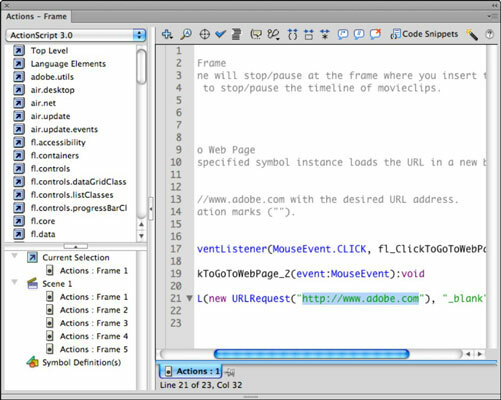 You can easily link to a website or web page within Adobe Flash CS6 movies by using a button or piece of text and a bit of code help from the Code Snippets panel. 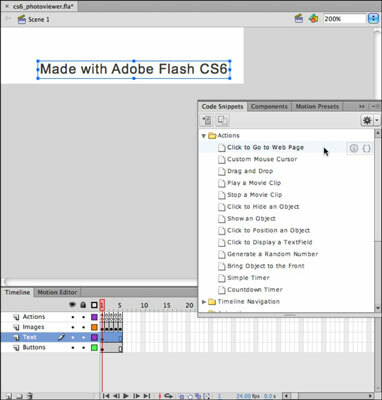 For your photo viewer, you link the text you placed on the stage to the Adobe website to let users know just how cool Flash is! Drag the playhead to Frame 1 on the Timeline. As with buttons, you add code for a text box at the beginning of the Timeline. Use the Selection tool to click and select the text box you created on the stage when you set up your movie. If the Code Snippets panel isn’t already visible, choose Window→Code Snippets to open it, or expand it from its icon view in the panel group on the right. In the Code Snippets panel, click to expand the Actions category. Locate and double-click the Click to Go to web Page code snippet. This step adds some new ActionScript to the existing Actions layer, which is tied to your selected button. You see a prompt that lets you know Flash will create an instance name for your text field automatically. Click OK. When the Actions panel opens to show you the new code that has been created, take a moment to review it. Notice that the http://www.adobe.com/ has automatically been inserted as the default. Keep in mind, however, that you can edit this web address to make your text link to any site you want. Save your movie and choose Control→Test Movie to preview it. Click the text field. Your default system browser opens to the Adobe website.